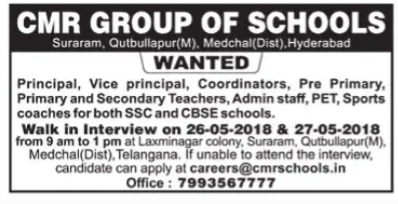 CMR Group of Schools, Hyderabad has advertised in THE DECCAN CHRONICLE newspaper for recruitment of Principal, Vice Principal, Teachers, Non Teaching Faculty jobs vacancies. 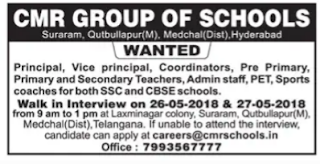 Interested and eligible job aspirants are requested to walkin 26.05.2018,27. 05.2018. Check out further more details below. About School: CMR Model High school was started in 1999 by "C Malla Reddy Educational Society (registered)". The founder of which was Late Sri C Malla Reddy. Whose vision was to bring quality education to all children, far and wide, privileged or under-privileged. CMR Model High School was proposed to be a model by itself for all round development of personality of the students at the crucial and formative stage. M.A,M.Sc, M.Com with B.Ed/M.Ed from recognised and reputed institution.